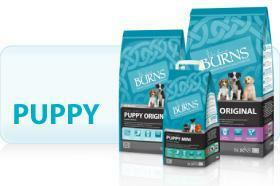 Details: Burns Mini Bites - A complete puppy food for all breeds from weaning to 6 months old. Also suitable for toy breed adult dogs. Controlled protein and fat levels to ensure a healthy, steady growth rate. Highly digestible (low residue less waste to pick up). Naturally preserved with vitamin E and Rosemary oil.